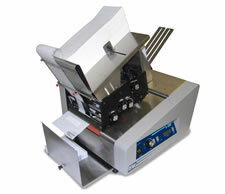 The Rena L-250 Tabber Machine is one cool little machine. Most tabbers in its class can do paper tabs only. The durable design of the Rena L-250 gives it the ability to run clear, translucent and paper tabs at speeds up to 25,000 per hour on a typical tri-fold mailer. The new control panel design and professional grade color scheme allow the Rena L-250 Labeler/Tabber to look good in workshops, warehouses, mailrooms and office environments while requiring less maintenance.